Nigeria’s Minister of Women Affairs, Aisha Alhassan, has resigned from the government of President Muhammadu Buhari, just as she announced her defection from the ruling All Progressive Congress (APC) to the United Democratic Party (UDP). The former minister, in a letter to Mr. Buhari expressed shock and dismay over the decision of the National Working Committee of APC to disqualify from her from contesting the 2019 governorship ticket. “I write with a lot of respect to inform Mr President of my decision to resign my appointment as a minister of the Federal Republic of Nigeria and as a member of the All Progressives Congress (APC),” the letter read. “Mr President may also wish to recall that I wrote to notify you of my intention to again contest for governor of my state in forthcoming 2019 election under the umbrella of the All Progressives Congress (APC) and you again graciously blessed my intention and wished me well through a letter personally signed by Mr President which I appreciate and will forever cherish. “Sir, I purchased the APC nomination forms and went for the party’s screening on Thursday, the 20th of September 2018 along with ten (10) other contestants for the governorship of my state, Taraba. I, with your permission, proceeded to Taraba on the 23rd of September 2018, to prepare for the presidential and governorship primaries then scheduled for the 25th and 29th of September 2018 respectively. APC National Chairman, Adams Oshiomhole, had told journalists that Mrs. Alhassan was disqualified from contesting the Taraba governorship primary over anti-party activities. Mr. Oshiomhole, in apparent reference to Mrs. Alhassan’s earlier comments in which she was quoted as playing allegiance to former vice president, Atiku Abubakar, said the minister had not been completely loyal to the APC, and the party could not tolerate those who played such persons within its ranks. He said after reviewing utterances from the minister and following her obvious relationship with one of the Peoples Democratic Party (PDP) presidential aspirants, the APC national working committee had no option than to disqualify her. “Atiku is my godfather even before I joined politics. And again, Baba Buhari did not tell us that he is going to run in 2019,” she had said in an interview with BBC. 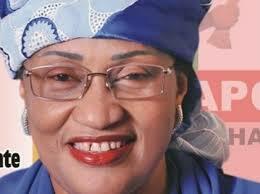 Meanwhile, Mrs. Alhassan, has announced her defection to the United Democratic Party (UDP).